Last month, Congress reauthorized Section 702, the controversial law the NSA uses to conduct some of its most invasive electronic surveillance. With Section 702 set to expire, Congress had a golden opportunity to fix the worst flaws in the NSA’s surveillance programs and protect Americans’ Fourth Amendment rights to privacy. Instead, it reupped Section 702 for six more years. But the bill passed by Congress and signed by the president, labeled S. 139, didn’t just extend Section 702’s duration. It also may expand the NSA’s authority in subtle but dangerous ways. The reauthorization marks the first time that Congress passed legislation that explicitly acknowledges and codifies some of the most controversial aspects of the NSA’s surveillance programs, including “about” collection and “backdoor searches.” That will give the government more legal ammunition to defend these programs in court, in Congress, and to the public. It also suggests ways for the NSA to loosen its already lax self-imposed restraints on how it conducts surveillance. First passed in 2008 as part of the FISA Amendments Act—and reauthorized last week until 2023—Section 702 is the primary legal authority that the NSA uses to conduct warrantless electronic surveillance against non-U.S. “targets” located outside the United States. The two publicly known programs operated under Section 702 are “upstream” and “downstream” (formerly known as “PRISM”). Section 702 differs from other foreign surveillance laws because the government can pick targets and conduct the surveillance without a warrant signed by a judge. Instead, the Foreign Intelligence Surveillance Court (FISC) merely reviews and signs off on the government’s high-level plans once a year. In both upstream and downstream surveillance, the intelligence community collects and searches communications it believes are related to “selectors.” Selectors are search terms that apply to a target, like an email address, phone number, or other identifier. Under downstream, the government requires companies like Google, Facebook, and Yahoo to turn over messages “to” and “from” a selector—gaining access to things like emails and Facebook messages. Under upstream, the NSA relies on Internet providers like AT&T to provide access to large sections of the Internet backbone, intercepting and scanning billions of messages rushing between people and through websites. Until recently, upstream resulted in the collection of communications to, from, or about a selector. More on “about” collection below. The overarching problem with these programs is that they are far from “targeted.” Under Section 702, the NSA collects billions of communications, including those belonging to innocent Americans who are not actually targeted. These communications are then placed in databases that other intelligence and law enforcement agencies can access—for purposes unrelated to national security—without a warrant or any judicial review. In countless ways, Section 702 surveillance violates Americans’ privacy and other constitutional rights, not to mention the millions of people around the world whose right to communications privacy is also ignored. This is why EFF vehemently opposed the Section 702 reauthorization bill that the President recently signed into law. We’ve been suing since 2006 over the NSA’s mass surveillance of the Internet backbone and trying to end these practices in the courts. While S. 139 was described by some as a reform, the bill was really a total failure to address the problems with Section 702. Worse still, it may expand the NSA’s authority to conduct this intrusive surveillance. One key area where the new reauthorization could expand Section 702 is the practice commonly known as “about” collection (or “abouts” collection in the language of the new law). For years, when the NSA conducted its upstream surveillance of the Internet backbone, it collected not just communications “to” and “from” a selector like an email address, but also messages that merely mentioned that selector in the message body. This is a staggeringly broad dragnet tactic. Have you ever written someone’s phone number inside an email to someone else? If that number was an NSA selector, your email would have been collected, though neither you nor the email’s recipient was an NSA target. Have you ever mentioned someone’s email address through a chat service at work? If that email address was an NSA selector, your chat could have been collected, too. “About” collection involves scanning and collecting the contents of Americans’ Fourth Amendment-protected communications without a warrant. That’s unconstitutional, and the NSA should never have been allowed to do it in the first place. Unfortunately, the FISC and other oversight bodies tasked with overseeing Section 702 surveillance often ignore major constitutional issues. For its part, the NSA asserted that “about” collection was necessary technically to ensure the agency actually collected all the to/from communications it was supposedly entitled to. In April 2017, we learned that the NSA’s technical and legal problems with “about” collection were even more pervasive than previously disclosed, and it had not been complying with the FISC’s already permissive limits. 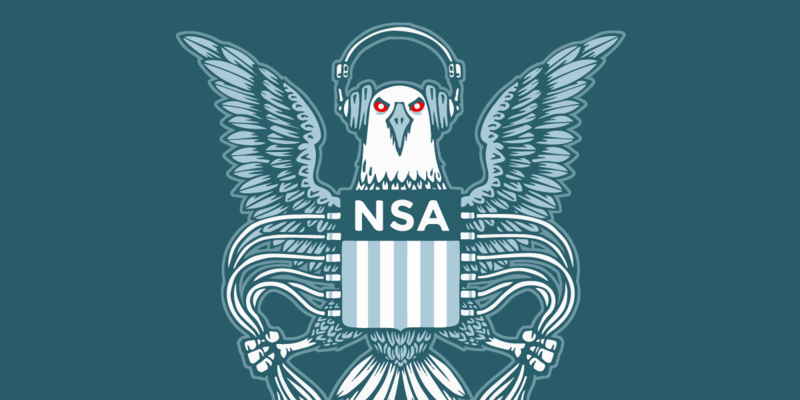 As a result, the NSA publicly announced it was ending “about” collection entirely. This was something of a victory, following years of criticism and pressure from civil liberties groups and internal government oversight. But the program suspension rested on technical and legal issues that may change over time, and not a change of heart or a controlling rule. Indeed, the suspension is not binding on the NSA in the future, since it could simply restart “about” collection once it figured out a “technical” solution to comply with the FISC’s limits. Critically, as originally written, Section 702 did not mention “about” collection. Nor did Section 702 provide any rules on collecting, accessing, or sharing data obtained through “about” collection. But the new reauthorization codifies this controversial NSA practice. Under the new law, if the intelligence community wants to restart “about” collection, it has a path to doing so that includes finding a way to comply with the FISC’s minimal limitations. Once that’s done, an affirmative act of Congress is required to prevent it. If Congress does not act, then the NSA is free to continue this highly invasive “about” collection. Beyond that, the reauthorization codifies a practice that, up to now, has existed solely due to the NSA’s interpretation and implementation of the law. Before this year’s Section 702 reauthorization, the NSA could not credibly argue Congress had approved the practice. Now, if the NSA restarts “about” collection, it will argue it has express statutory authorization to do so. Explicitly codifying “about” collection is thus an expansion of the NSA’s spying authority. Finally, providing a path to restart that practice absent further Congressional oversight, when that formal procedure did not exist before, is an expansion of the NSA’s authority. For years, the NSA has pushed its boundaries. The NSA has repeatedly violated its own policies on collection, access, and retention, according to multiple, unsealed FISC opinions. Infamously, by relying on an unjustifiable interpretation of a separate statute—Section 215—the NSA illegally conducted bulk collection of Americans’ phone records for years. And even without explicit statutory approval, the NSA found a way to create this bulk phone record program and persuade the FISC to condone it, despite having begun the bulk collection without any court or statutory authority whatsoever. History teaches that when Congress gives the NSA an inch, the NSA will take a mile. So we fear that the new NSA spying law’s unprecedented language on “about” collection will contribute to an expansion of the already excessive Section 702 surveillance. The Section 702 reauthorization provides a similar expansion of the intelligence community’s authority to conduct warrantless “backdoor searches” of databases of Americans’ communications. To review, the NSA’s surveillance casts an enormously wide net, collecting (and storing) billions of emails, chats, and other communications involving Americans who are not targeted for surveillance. The NSA calls this “incidental collection,” although it is far from unintended. Once collected, these communications are often stored in databases which can be accessed by other agencies in the intelligence community, including the FBI. The FBI routinely runs searches of these databases using identifiers belonging to Americans when starting—or even before officially starting—investigations into domestic crimes that may have nothing to do with foreign intelligence issues. As with the initial collection, government officials conduct backdoor searches of Section 702 communications content without getting a warrant or other individualized court oversight—which violates the Fourth Amendment. Just as with "about" collection, nothing in the original text of Section 702 authorized or even mentioned the unconstitutional practice of backdoor searches. While that did not stop the FISC from approving backdoor searches under certain circumstances, it did lead other courts to uphold surveillance conducted under Section 702 and ignore whether these searches are constitutional. Just as with "about" collection, the latest Section 702 reauthorization acknowledges backdoor searches for the first time. It imposes a warrant requirement only in very narrow circumstances: where the FBI runs a search in a “predicated criminal investigation” not connected to national security. Under FBI practice, a predicated investigation is a formal, advanced case. By all accounts, though, backdoor searches are normally used far earlier. In other words, the new warrant requirement will rarely, if ever, apply. It is unlikely to prevent a fishing expedition through Americans’ private communications. Even where a search is inspired by a tip about a serious domestic crime [.pdf], the FBI should not have warrantless access to a vast trove of intimate communications that would otherwise require complying with stringent warrant procedures. But following the latest reauthorization, the government will probably argue that Congress gave its OK to the FBI searching sensitive data obtained through NSA spying under Section 702, and using it in criminal cases against Americans. In sum, the latest reauthorization of Section 702 is best seen as an expansion of the government’s spying powers, and not just an extension of the number of years that the government may exercise these powers. Either way, the latest reauthorization is a massive disappointment. That’s why we’ve pledged to redouble our commitment to seek surveillance reform wherever we can: through the courts, through the development and spread of technology that protects our privacy and security, and through Congressional oversight.